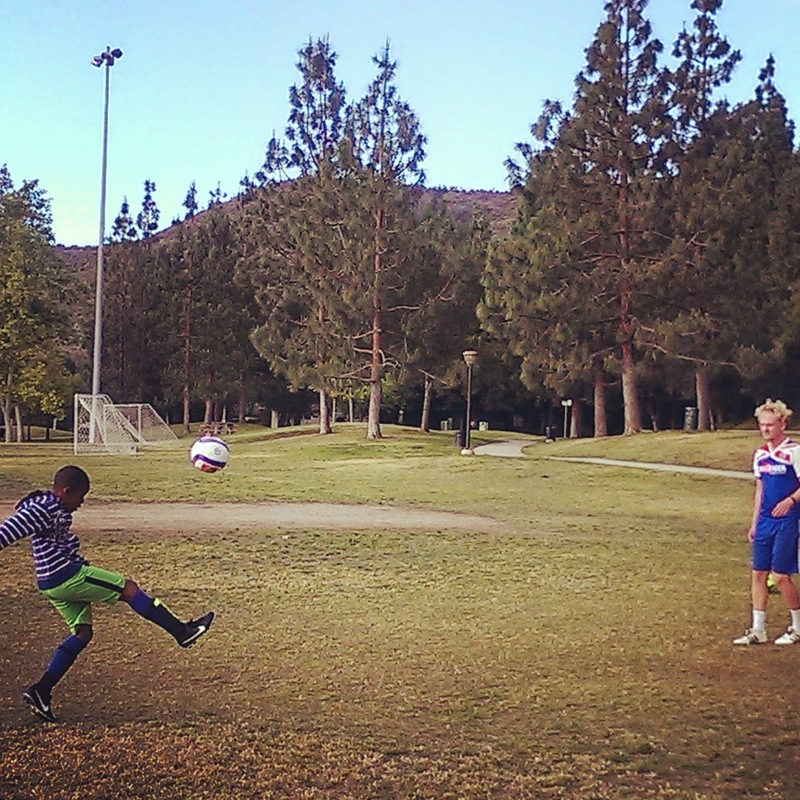 My son has always tried many sports and this year he decided he wants to play soccer. To ensure this is the sport for him, I enrolled him British Soccer Camps, so he could get a better feel for the sport. Finding a camp close to my home was very easy. When I went to the British Soccer Camp site and typed in my address many camp locations popped up for different times of the year. I was fortunate enough to find a camp less than 10 miles from my house and it worked well with my schedule. On the first day he arrived he did not know any technique. He even wore his shin guards over his socks. I thought something looked wrong because, my daughter did not wear her guards like that when she played. He went there with a desire to learn and to meet new kids. The camp was for one week and I was definitely interested in hearing his thoughts each day. He had two great coaches that had awesome personalities and to my novice eye they had awesome soccer skills. I did not ask them, but some of the kids along with my son said these two had participated in the Olympics. If so, that explains a lot. I never got around to asking. When it was time for drop off or pick up it seemed all of the parents were bidding for their attention. These guys were awesome! Although, asking them if they had participated in the Olympics seemed important it was not as important as seeing the smile on my sons face and watching him handle the ball when we returned home. 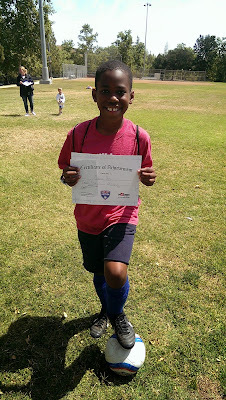 Soccer camp was impacting him daily. On the second day the kids were given a t-shirt and soccer ball. My son so excited. He wore his shirt to camp the next day only to discover he was the only camper wearing the shirt. He did not care he was proud. He was having an amazing time. He enjoyed it so much he did not want the last day to come. He had met new kids and was learning many skills and techniques. 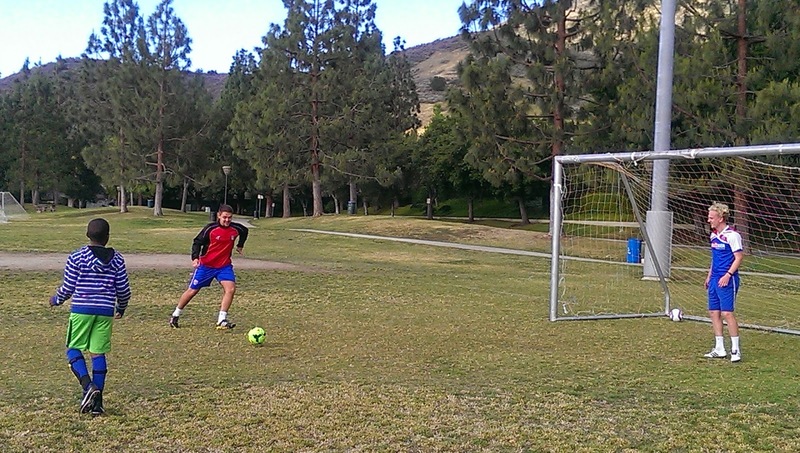 He enjoyed it so much he knew that soccer would be his Fall sport this coming Fall. As I drove him to camp on the last day my son was sad that the day had finally come. When I picked him up he had a huge smile on his face. He had received a certificate of achievement. His coaches told me that he excelled. 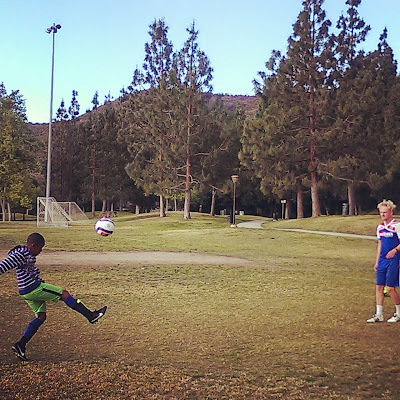 He learned to kick, handle the ball properly and learned a couple of cool tricks. Some the kids had played soccer before, but being in this camp allowed him to challenge himself. As we made our to our car my son and the other children said their goodbyes. He had met some knew fun kids and had an awesome camp experience. Since camp has ended we have purchased more soccer shoes and are looking forward to him playing soccer in the Fall. Disclosure: Product/compensation was received in exchange for review. Don't be afraid to be free!! !